‘Tis the season! The countdown is on and the holiday dessert season has begun! 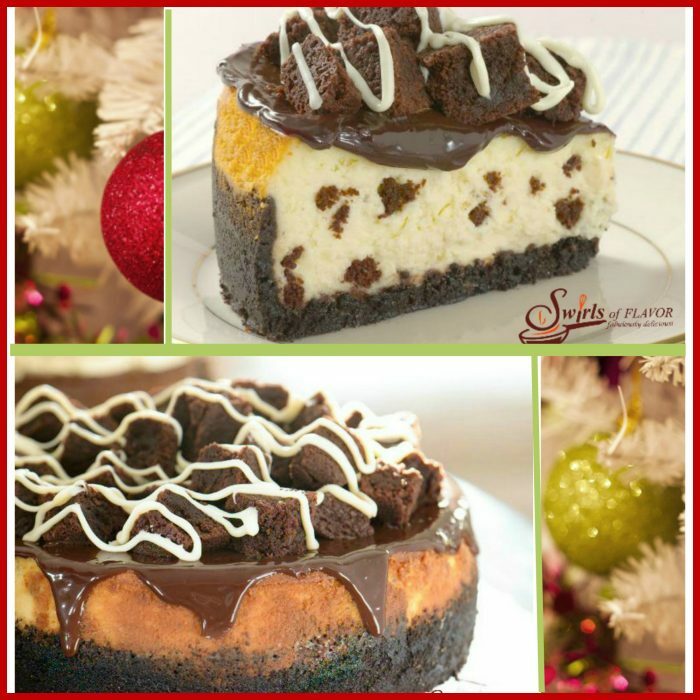 Loosen your belts because Swirls of Flavor has it’s most popular holiday desserts all here in one place for you! 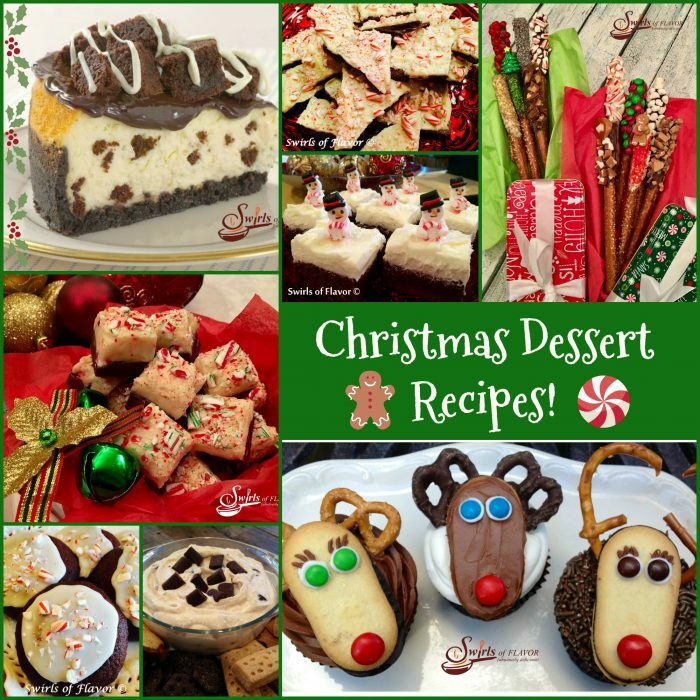 Christmas Dessert Recipes will become your go-to list of festive favorites! 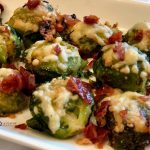 Click on the links for each recipe. Need a fun and merry dessert but don’t want to turn your oven on? 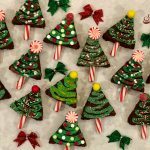 Then No-Bake Peppermint Bark Cookies, Chocolate Dipped Holiday Pretzels and Candy Cane Fudge are calling your name! 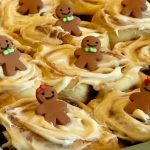 Going to a cookie swap? Peppermint Crunch Red Velvet Cookies, Coconutty Almond Sugar Cookies, Silver & Gold Chocolate Glitter Cookies and Cranberry Almond Oatmeal Cookies should be top on your baking list! 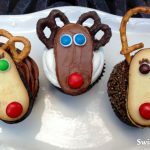 Get the fun started and the kids involved and make Rudolph The Red Nosed Reindeer Cupcakes together. You don’t even have to bake cupcakes. 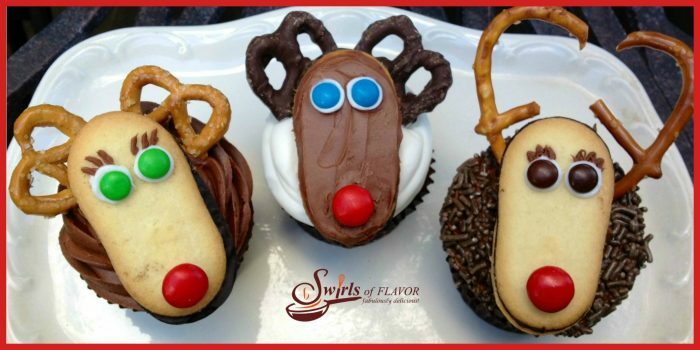 Just buy cupcakes at a bakery and top them with the cookies you decorated as Rudolph! 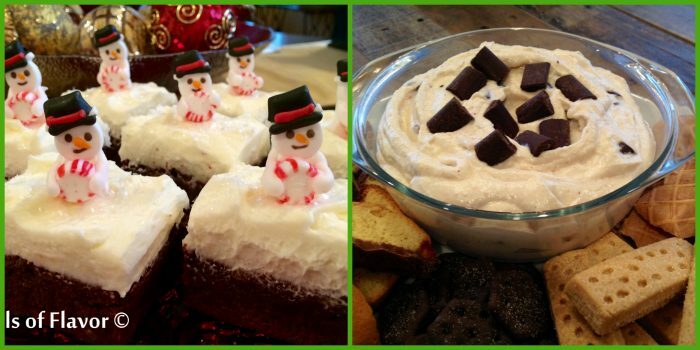 Peppermint Snowmen Brownies are not just cute but full of fudgy deliciousness too! There’s always that last minute dessert you need to make and bring. Not a problem! You can make Chocolate Chunk Cannoli Dip in just minutes and surround with fabulous store bought cookie dippers. Now isn’t that easy? And please, please, please, don’t forget the holiday cheesecake, the piece de resistance! This year make it a Fudge Brownie Cheesecake that’s topped with homemade brownies and fudge sauce and studded with brownie bits throughout a decadent creamy cheesecake filling.